The more I suffer, the more flowers I want to offer Jesus. A doctor said to Father Anthony, We have already a Saint Anthony. You will be a Saint Anthony martyr of suffering. Brother, we have not received from Our Lady the grace of a cure, but much enlightenment , comfort and resignation. The roses are for Jesus, the thorns for me. After his Profession he completed his secondary studies in Bologna and obtained his Licentiate in 1922. Then he began his theological studies – an immediate preparation for the Priesthood. As well as being diligent and constant in his studies, he showed great exactness in observance of rule, thus giving an example of solid piety and heartfelt charity. His professor of Philosophy, Monsignor Olindo Corsini, defined Anthony as a “diligent and conscientious student, a mortified and exemplary religious”. Meantime the long hours of tenacious study, carried on with much sacrifice, his long night vigils, his renouncing all pastimes were the cause of his first signs of illness, which increasing with the passing years, brought on death in a short time. Anthony’s life from now on will be marked with the Cross. The undue fatigue and efforts made to obtain the Licentiate ended in undermining his already weak frame. Perhaps an immediate cure or a period of rest and absolute repose could have curbed the malady, but a natural repugnance in revealing his sufferings to his Superiors made him remain silent with the hope of an early return to health. His brother, seeing him growing thinner, endeavored to provide him with something more nourishing. 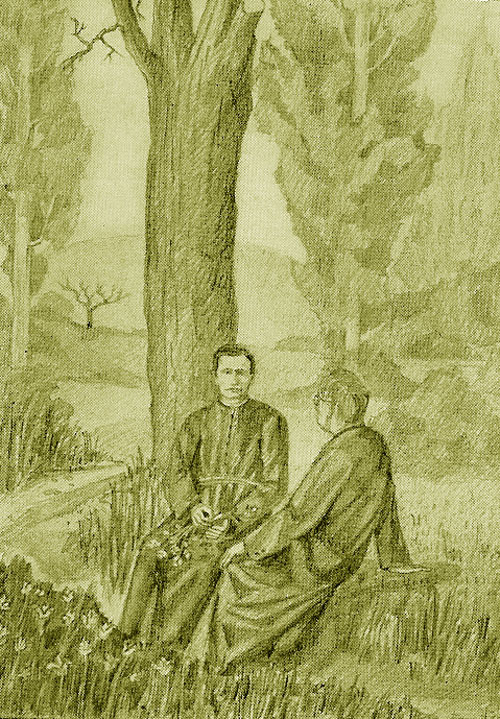 Anthony accepted all for a short time, but one day remarked: “You are like the sister of St. Therese who tried to cure the saint with motherly tenderness and instead bare her more occasions of mortification, because she served her according to her own tastes – quite contrary to that of the Saint”. After an apparent recuperation of his strength there followed a great lassitude which caused him to walk with a tottering gait. His companions, unaware of the reason, used laugh at his manner of walking, but he laughed with them, treating it as a passing phase of his illness. Unfortunately it was only an illusion that his illness was to be a passing thing – he had begun the way of the Cross and would have to reach the height of Calvary. And he was aware of it. A tender episode reveals the interior force of his soul. One day, while he was preparing flowers for the altar of the Blessed Sacrament, his expression betrayed the fact that he was suffering acutely. A confrere noticed it and said to him – “Poor brother, you’re suffering, aren’t you?” “Just a little more than usual” he answered with a smile. “And why then are you tiring yourself with looking after the flowers? You should go to bed for awhile”. “My friend” he said, ”the more I suffer, the more flowers I would like to prepare for Jesus”. His illness became much worse; his arms lay powerless: insomnia increased making even the slightest application almost impossible. He became frightfully thin and worn out by fatigue. His eyes we sunken in his head and it was a piteous sight to see him wandering about the corridors of the house. In the presence of this frightful deterioration his Superiors brought him to see the renowned physician, Doctor Murri. Anthony gave the doctor an outline of his illness, describing its phases and its progress. Dr. Murri’s diagnosis was discouraging: the nervous system of the patient was in a state of collapse, the case was serious and he told this to the patient with the words:” You can become better, but you cannot ever be cured”. This serious declaration of the doctor prostrated Anthony anew. After such long protracted hopes, all that lay before him now was the compete vision of the Cross. However he was neither frightened nor discouraged. His great fear for the moment was that he might be obliged to give up his studies, even have to leave the religious house and what was most discouraging of all was the thought that he would never be able to become a priest. This had been the great ideal and desire of his whole life. His Superior next brought him to see a specialist in nervous diseases. Again the verdict was discouraging. The doctor asked the patient what his name was. He answered:” Anthony”. “Well”, murmured the doctor,” we had already a St. Anthony. You will become a St. Anthony, martyr of all suffering”. Everything seemed to come crashing down for poor Anthony. The hopes of being one day a priest seemed a far way off, but his desire for holiness did not die within him. He advanced all the more, in spite of his bitter trials, in his life on sanctity and perfection. So many wonderful examples of piety and sanctity sprang from this period of his life. Incidents of charity, of mortification, of obedience and submission to the will of God. Such virtues, practiced in a heroic degree, convinced his Superiors that he should be permitted to make his Perpetual Vows. 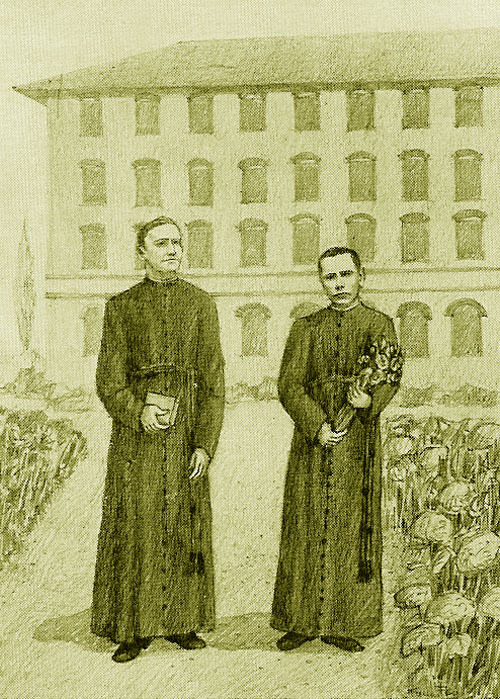 He was permitted, also, to receive the minor Orders of Ostiarius and Lector with his companions on December 20th., 1924 and those of Exorcist and Acolyte on March 28th., 1925. 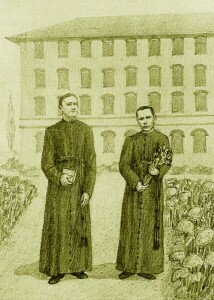 He was not, however, admitted to Ordination to the Priesthood in 1926 with his companions who were then ordained. At that time his illness had manifested itself completely and his Superiors thought it would be better that he should not be permitted to receive his Major Orders. Trials accumulated. 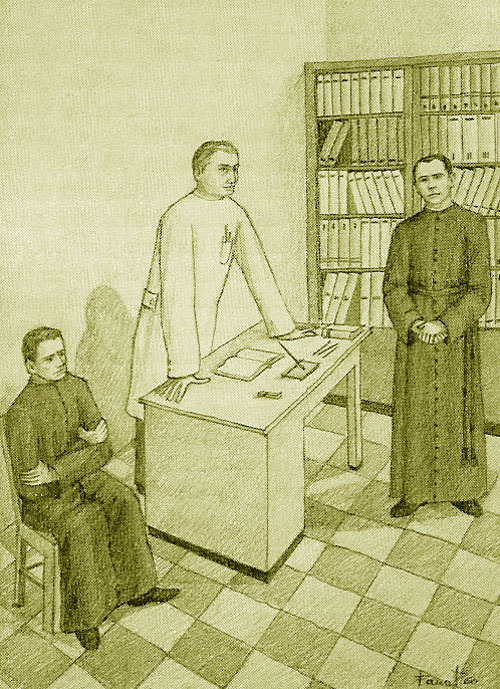 In September of 1927 the new Superior of the College, Father Francis Cortinovis, seeing how ineffectual were all human remedies sought supernatural aid, turning to her whom the sick invoke under the name of “Health of the Sick”. He had Anthony leave for Lourdes with a companion. His pilgrimage lasted from the seventeenth of September till the twenty-second. Anthony reached Lourdes with great hope in his heart and waited for any sign that would bespeak a miracle. But his cure was not forthcoming and he ad to mount his calvary. He understood, as so many other invalids, that the good Lady of the Pyrenees had given him a greater gift than that of physical relief. 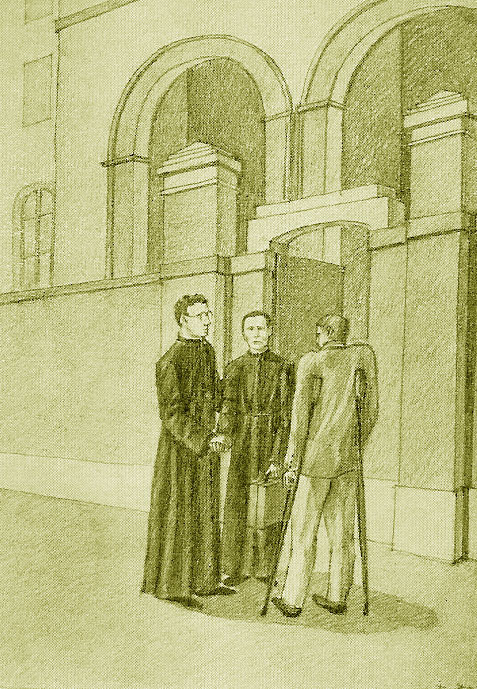 On his return to Bologna he was able to say with complete resignation shining in his eyes to the confrere who opened the door:” We have not received the grace of being cured, but of a great comfort, light and resignation”. 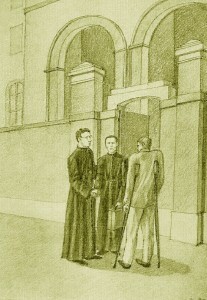 As his malady progressed all application to study, and finally even to prayer became impossible, and consequently his Superiors advised him that he should return to his family. Perhaps his native air would bring back to him the strength of body that the work of the priesthood would demand. At first he raised some objections but finally accepted the advice of his Superiors as being the will of God. He departed without giving up all hope of being able one day to return to his beloved Congregation. The loving care of his family, and particularly the loving care of his mother seemed to give strength to his spirit and to his body, but after the first days, however, he began to feel dissatisfied and little by little the fear of having acted against his vows, of having been wanting in fidelity to God would allow him no peace of conscience. He wrote to the Father General, Fr. Lorenzo Phillipe who had succeeded Fr. Dehon, asking him for advice, for aid and for comfort. Years passed and Anthony was advised to apply for a dispensation from his vows. But his heart was sorely grieved. The Superior General tried to comfort him. His kind words seemed to remove all apprehension and make him resigned to separate himself from the Congregation. But it was for him a cruel separation. In his sensitive soul he began to feel that thorns and sorrows were to be his continual portion. Walking one day with his cousin Gelasius, he saw some roses, he picked several of them and almost by instinct began to take off the thorns. When his cousin asked him what he was doing he replied, “The roses are for Jesus, the thorns are for me”. He felt that the cross was his lot and he embraced it generously. A more lasting and terrible trial was awaiting him. While he was with his family his beloved mother died on the seventh of November 1928. Anthony comforted her with words of faith and Christian hope, preparing her for the passage to eternity. He accepted with quiet resignation the will of God, but his worn out spirit was almost overcome by this terrible tragedy. Long years afterward – Anthony was then dead – there was found in the coffin of his mother, a small glass tube in which there was a letter which one cannot read without great emotion. It was his last farewell to his beloved mother. The permanent recollection of his mother was always a precious remembrance which ever comforted him and gave him strength and encouraged him in well doing. The loss of his mother aggravated Anthony’s condition. He was overtaken with a feeling of the greatest lassitude. The year 1929 passed for him in a state of absolute hopelessness. After he had been granted the dispensation from his vows, the Superior General was so kind as to recommend him to the bishop of Avellino to have him incorporated into his diocese. He was accepted and on the fourteenth of June 1930 he was admitted to the Subdiaconate and on the tenth of August he was made Deacon. Soon he would made the great step; he was again on the road towards his ideal from which he had never deviated, ever hoping with resignation to the will of God.